Running with SD Mom: Healthy Juicer: #KidsJuiceToo Review & #GIVEAWAY! Disclaimer: I was sent a Wheatgrass Juicer for review and giveaway purposes. I was not compensated in any other way. Remember when I told you yesterday that I was going to have a review and giveaway of a cool new wheatgrass juicer? Well here it is! 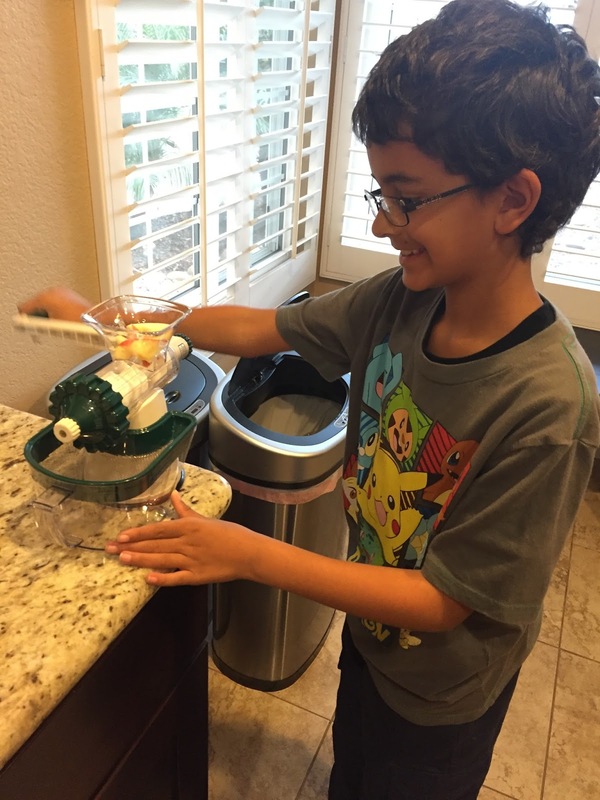 When the Healthy Juicer company reached out to me to try out their juicer for their Kids Juice Too campaign, I was super intrigued. D has been taking a gardening class at his school and has become super interested in vegetables and juicing. So when I told him about this project, he was super excited! 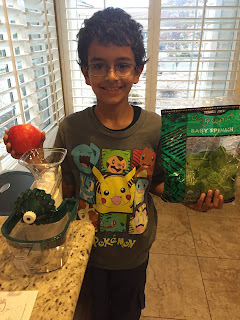 Since it arrived, he has been bugging me about getting some "leafy greens" so we could get started! Here is the base. 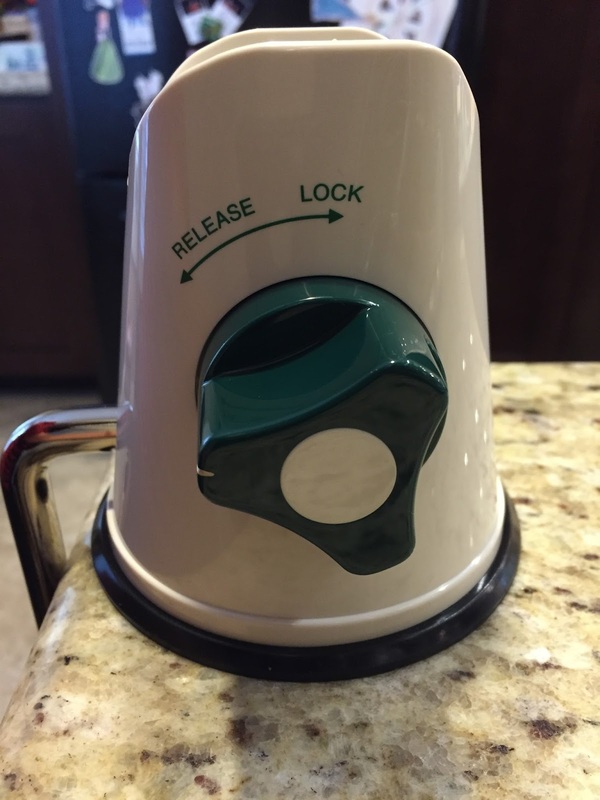 It clamps down to any counter or table. 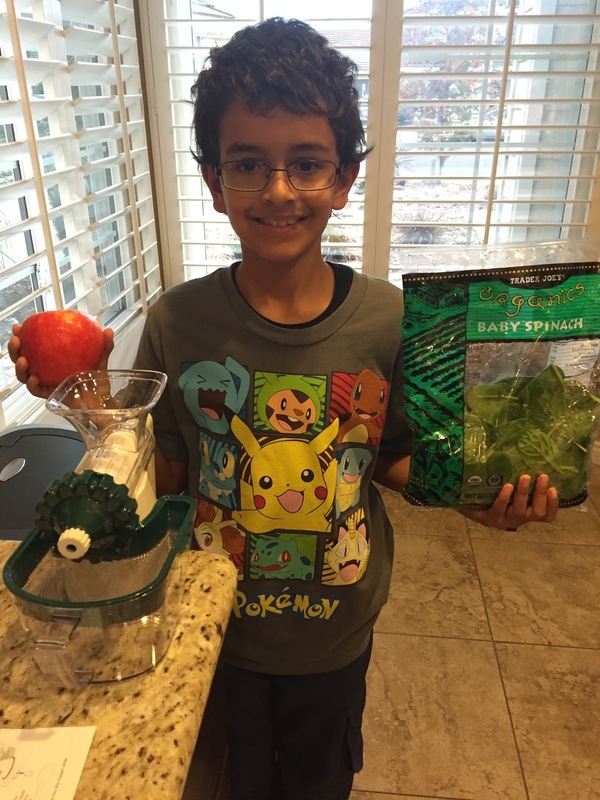 Here is my boy D with all the ingredients for our Apple Spinach Juice! 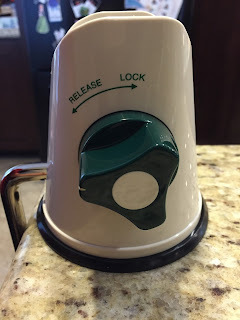 Here he is demonstrating how easy it is to turn the handle. Then of course, when D does something, S needs to be involved too. 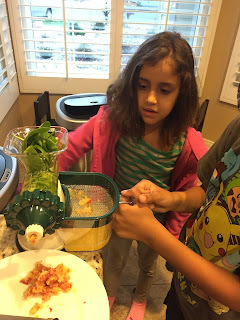 So here SHE is demonstrating how easy the juicing is. Now time for the spinach! Look how pretty and green that is! Enough juice for the whole family out of one Honeycrisp apple and half a bag of spinach. CHEERS! It was really delicious! 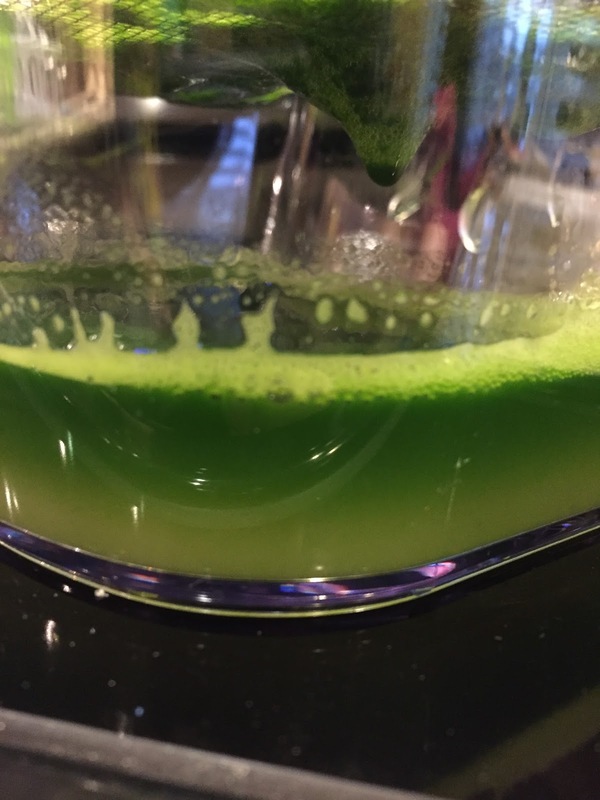 I will say I was a little surprised at how much fiber and pulp is left over after juicing. Look at that gorgeous green spinach. You could throw it in some muffins, pasta sauce or meatballs. 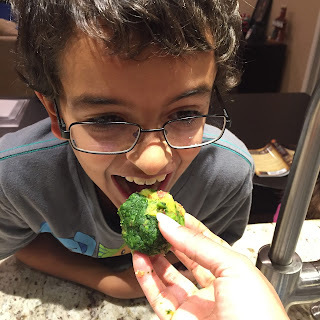 Or you could be a mean mom and make your kid eat the apple spinach fiber ball! 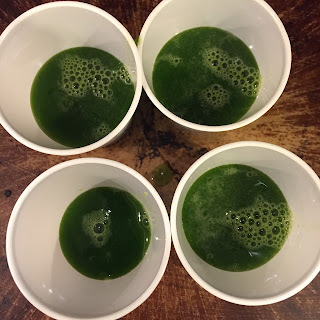 - Juicing: How Healthy Is It? 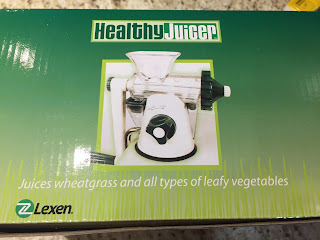 So now, I am giving away a Healthy Wheatgrass Juicer to one of you lucky readers! (value $49.99) Great way to start the new year on a healthy note! You know the drill. Enter on the Rafflecopter! Winner will be notified via email (if available) and/or blog post, and will have 24 hours to claim prize. If original winner does not claim prize within 24 hours, an alternate winner(s) will be selected. Contestants must enter on the Giveaway widget in order to win. All winning entries will be verified. If a winning entry cannot be verified as completed, a new winner will be drawn. Winner will be provided the prize directly from Healthy Juicer. Substitutions unlikely but may apply. SD Mom not responsible for failure of sponsor to deliver product. 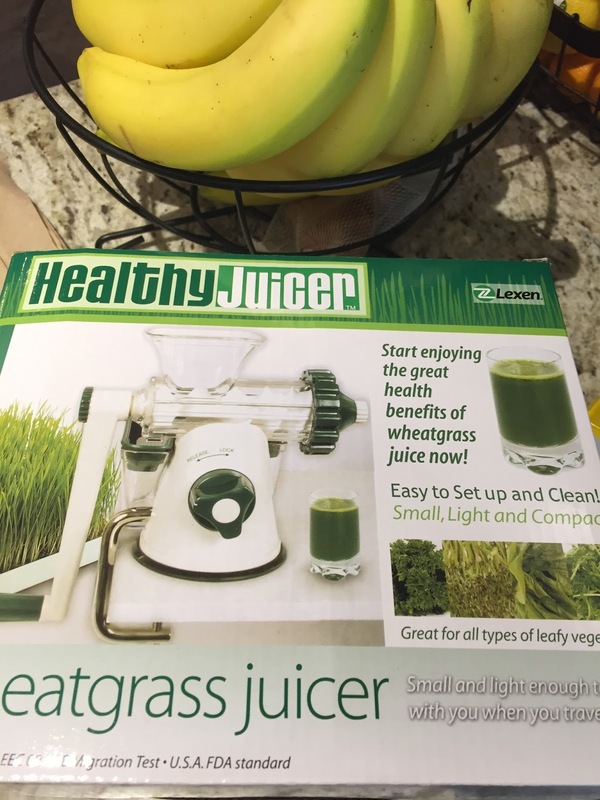 So tell me how you would use the juicer? For yourself? For the kids? Have you juiced before? Have any good recipes? Awesome giveaway! I'd use it for myself and my son! My son and I love getting juices at farmers markets. He and I would for sure have a great time creating new juice mixes together! Yay! I'd use this for breakfasts! I always wonder about what one does with all that fibre/pulp left over. Could you put it in baking or tomato sauce or soup? Hmmmm. Looks like fun though. yes!! we love juice! this is perfect for our family. I would make some great pre-workout smoothies. I would use it for my whole family! I don't have children, but I'd definitely try my hand at carrot juice! I would use this for my whole family! Believe it or not, my kids would love this! I would love to win this awesome prize and use it for my family! I would use it for my fiancee and myself! My kids need it more than I do. I would totally use this juicer for me, my husband, my daughters, and maybe my grandson unless he says "that's nasty"! 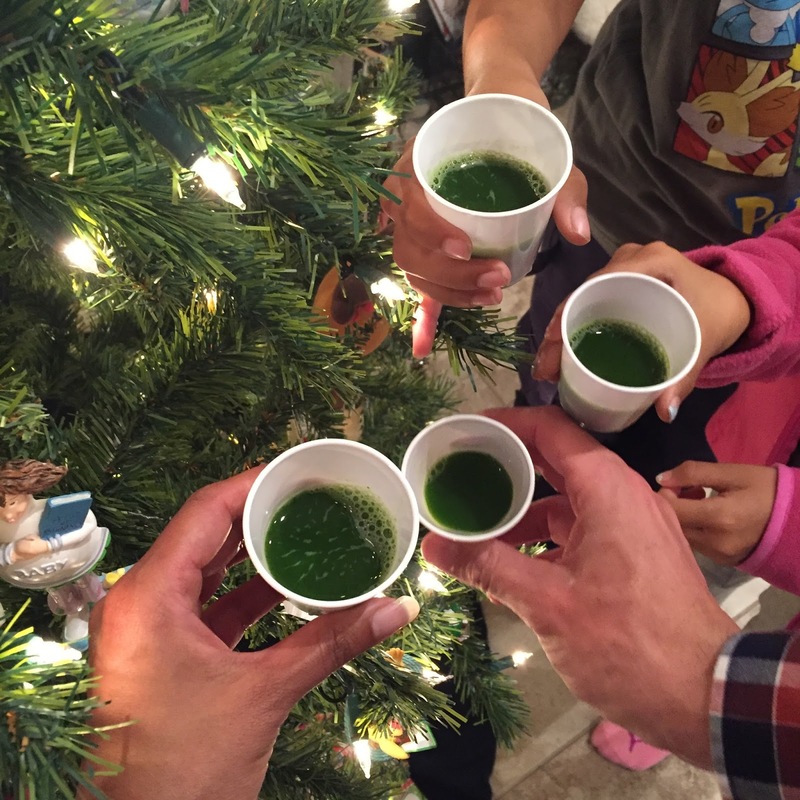 Not sure where he got that from lol but the rest of us love juicing! I would use it on my healing journey from endometriosis and anxiety. I don't have kids, so I would use it for myself. I'm going to start training for my first marathon next month, and really want to make nutrition a key component of my training. 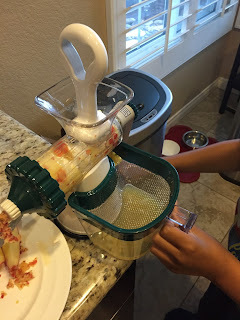 Both myself and my son would love to use a juicer. I would use it for my daughter and son. I love the idea of using the pulp to bake. Juicing and baking- two great activities to included kids. For me for sure! My kids are fruit juice though, so apple juice could be fun, and I could sneak in some other things. Actually the making of it sounds right up their alley! I would use it for both ...everyone in the family. Happy Holidays! I've been wanting to blend together a bunch of veggies for juice, rather than spend so much money buying a bottle! i would use it for everyone in my family! I would use it for all of us!! !